A flare up occurred on Wednesday afternoon, but it was contained. Harris County and the City of Houston, as well as the EPA and the TCEQ, continue monitoring air quality. Firefighters battle a petrochemical fire at the Intercontinental Terminals Company Monday, March 18, 2019, in Deer Park, Texas. Updated on Wednesday, March 20, 2019 at 6:50 p.m. 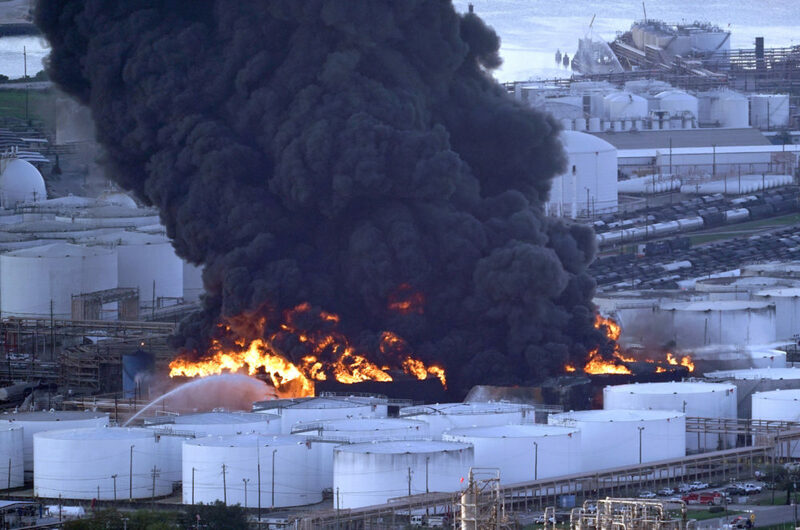 The cause of the massive fire at the Deer Park petrochemical storage facility is currently under investigation and Harris County and the City of Houston continue monitoring air quality. The fire was extinguished as of early Wednesday morning, according to a press release from Intercontinental Terminals Company (ITC). Firefighters put out all tank fires as of 3 a.m. on Wednesday, using spray foam and water to cool the tanks and prevent them from reigniting. The fire erupted on Sunday, and as of Tuesday afternoon eight of the facility’s 15 tanks were still ablaze. Rachel Moreno, a public information officer with the Harris County Fire Marshal Office, confirmed that there was a flare up on Wednesday afternoon but it was contained. Firefighting crews, including the county’s hazardous materials team, remained at the site on Wednesday afternoon. Hidalgo said federal and state agencies are studying the environmental impacts of the fire. Mayor Sylvester Turner said the City of Houston is also monitoring the air quality. He said they’re sampling for benzene and 50-plus other volatile organic compounds (VOCs). The Environmental Protection Agency (EPA) conducted air quality tests throughout the Houston area, both on the ground and from a small airplane, and “measured no levels of hazardous concentrations,” said agency official Adam Adams. The EPA also reviewed data collected by ITC, Harris County and by the Texas Commission on Environmental Quality (TCEQ). Those data didn’t show hazardous concentrations of volatile organic compounds, Adams said. The TCEQ said in a statement that the benzene levels it found near and around the storage facility don’t pose a health concern. The agency, along with the EPA, are waiting for test results of water samples to determine any potential impacts from the foam used to fight the fire on waterways next to the storage facility, including the Houston Ship Channel. But some residents who live near the storage facility said Wednesday they don’t have confidence in the air quality test results. “Everything has been wrapped up in this nice perfect bow in saying that there were no problems. Every air quality was perfect. Every wind was perfect blowing it away. And if everything was so perfect, why did it happen?,” longtime Deer Park resident Terri Garcia said. He said his environmental group has concerns not just about the air quality, but about potential impacts to the environment and the fishing industry if chemicals from the storage facility or foam used to fight the fire leaked into the Houston Ship Channel, which leads to the Gulf of Mexico. “This issue isn’t over just because the fire is out. We want systems in place that will protect our communities,” Parras said. ITC said no serious injuries have been reported as a result of the incident, but the cause of the fire still remains unknown. “As soon as it is safe to get our personnel in the tank farm, we will begin a root cause investigation,” said Richardson. Because of the incident, multiple school districts canceled classes and after-school activities on Wednesday, including Channelview ISD, Deer Park ISD, Galena Park, La Porte, Sheldon, Pasadena ISD, and YES Prep East End and Southeast. HISD schools were open, but as a precaution, school officials said outdoor practices and activities in the immediate area of the Deer Park facility were canceled.